With the Heartlake City Pool by LEGO Friends, every day can be summer vacation. This colorful set has everything the Andrea and Isabella mini-dolls need to have some fun in the sun. Your child can make them zip down the water slide into the pool, cozy up in the hot tub, or grab a tasty ice cream cone at the snack shack. The set includes two lounge chairs and a variety of accessories for the mini-dolls to play with, including a basketball and beach bag. Includes a changing room, hot tub, and water slide for fun in the sun. Visit the snack bar for a hot dog or ice cream cone. Designed for kids from 6 to 12 years old, the Heartlake City Pool comes with a variety of settings to inspire storytelling-based play. After the Andrea and Isabella mini-dolls use the changing room, they can splash in the hot tub, zip down the pink water slide, or splash under the waterfall. There's even a basketball and hoop, so the mini-dolls can play a friendly game of one-on-one in the pool. When it's time to relax, Andrea and Isabella can lounge on the two included beach chairs and catch some sun. When it's time for lunch, the mini-dolls can visit the snack bar and decide whether they prefer a hot dog or ice cream cone. This set also comes with a cafe bar, complete with a pink umbrella and two green seats. Once snack time is over, the Friends can climb up to the tree house and pretend to listen to their favorite tunes on the speakers attached by the slide. 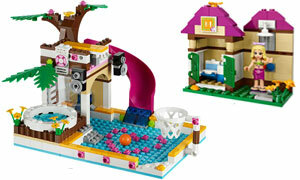 LEGO Friends mini-dolls and bricks are compatible with other LEGO bricks and accessories. This LEGO set includes over a dozen different accessories to make your Heartlake City Pool summertime-ready. Stock the snack bar with ice cream, drinks, and a cash register. There's even a handy beach bag, so Andrea and Isabella can stow their belongings. And don't forget to add the bright yellow flowers for a dash of sunny color next to the pool. LEGO Friends Heartlake City Pool (423 pieces) including Andrea and Isabella mini-doll figures, accessories, and building instructions.